When I think about the birth of our Lord and Savior Jesus Christ, the parallels are obvious. For in the midst of everyday living and everyday tasks, heaven joins earth to impart a blessing of great joy. In the midst of crowds traveling, shopping, taxes, and labor, come Joseph and Mary into this turbulence. I don’t know about you, but when I think of the Christmas carol “Silent Night”, I often think that it probably wasn’t a very silent night on earthly terms, overflowing inn, cattle, sheep, donkeys, camels, and who knows what other animals were joining in the noise. 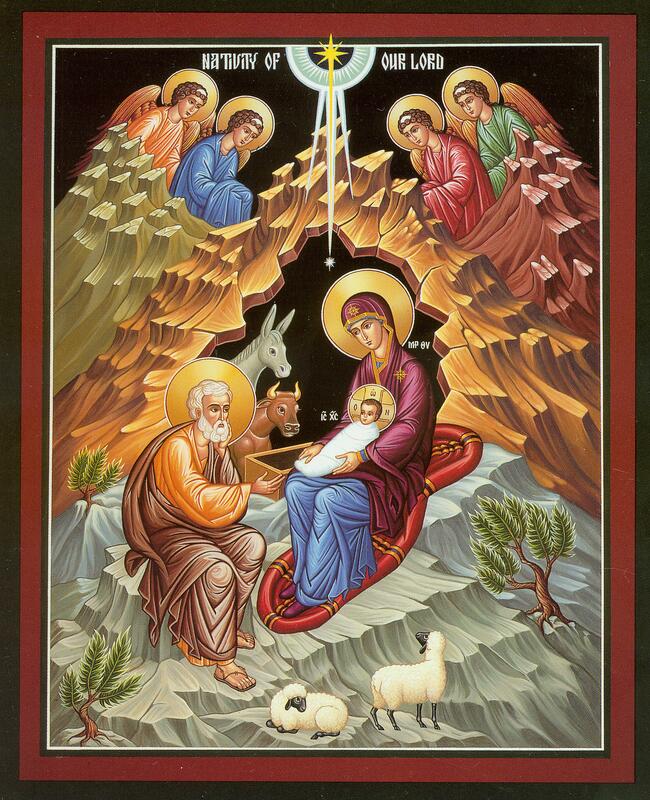 Yet, imperceptibly a baby is born, not just any baby, not just any boy, but the incarnate God, the God-man, Jesus. 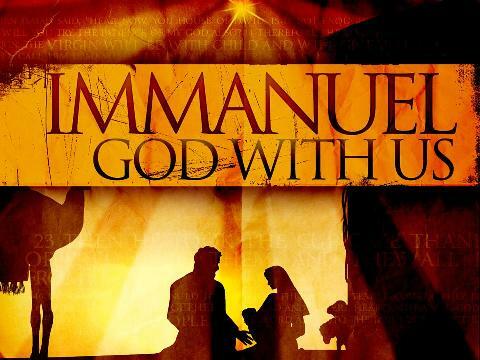 Immanuel – God with us. Yes, God came down into the midst of our earthly everyday lives, dwelling, walking, and living among us. And for those of us who may be simple shepherds or maybe even a wise seeker, God is still waiting to impart to us joy, peace, hope, love and eternal salvation. I am sure there are hundreds of moments I have missed out on instances of “heaven touching earth”. Christmas is a wonderful time of year to reconnect with God and celebrate the Nativity of Christ, God reconciling man to himself and to one another. God provided his angels to the shepherds, a star to the wise men, a donkey and a manger to Joseph, Mary and the Christ child. God is ready to speak, to guide, to provide if I only keep my heart tuned into Heaven. As I reflect over the past year I can see how God has spoken, guided and provided so faithfully and compassionately. Thankfully because of God’s mercy in spite of the times my heart was tuned in elsewhere on earthly concerns He still reached down and was with me. This year I had the privilege of taking in at two different times a foster dog. Our first one was Beau Ty, an Australian Kelpie Heeler mix. Our second one was Kel, another Australian Kelpie. Both of these dogs needed training and fortunately they both were adopted into wonderful homes. I had a number of “health issues” at the beginning of the year including the swine flu and a few upper respiratory infections. I also was bitten by a loose cat (in the middle of one of my puppy classes) and subsequently underwent a series of rabies vaccinations. Our two cats had to have teeth pulled and dental work. My dog, Dani Joy, underwent surgery for an abscessed infection that was probably caused by an embedded fox tail (last year she had a fox tail removed from an area nearby). My other dog, Patrick Ryan, continued to go downhill in his health and the weekend prior to Thanksgiving I had to say goodbye to my sweet boy. I finished my Animal Behavior College Dog Training course and graduated with honors. I left Petco the first part of October and am now working for Cari Bowe of Shasta Dog Training teaching dog classes and assisting in her board/train business. Although I have gone through some trials, God has been faithful to see me through. I am thankful for many things… most importantly my family and my friends. I am blessed and I look hopeful to the new year, not because of my goals, or my plans but simply because Immanuel, God is with us. May you find joy, hope, peace, and love in Christ this season and every season. For Unto Us a Child is Born… Unto Us a Son is Given! 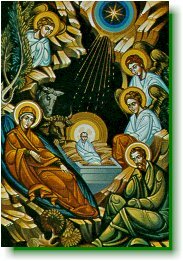 The above are Eastern Christian Orthodox Hymns on the Celebration of the Nativity of our Lord and God and Savior Jesus Christ. I can not believe how quickly Christmas is approaching and another year is coming quickly to an end. As usual, I can honestly say my life is not dull and I have had another “interesting” year. I have kept quite busy more than the past several years. I have had my share of trials, and yet many of my friends and family have had suffered far greater than I. Again, I have so much to be thankful to God for. As I reflect back on this past year I am reminded of God’s faithfulness and that He ALWAYS answers prayer. I know God is faithful and is truly Emmanuel, “God is with us”. He has truly been with me even in my stumbling, my falling, my stubbornness, my foolish pride, in spite of it all… He is still with me. I can look back and see His hand guiding me, supporting me and comforting me even in my darkest days. It has been 7 years since I left the Pregnancy Center and I am still officially considered “disabled” and unable to work a “regular” part-time job. Still in spite of the day to day changes and all the unplanned ups and downs. God is still teaching me to make the most of each day that He has given and just because I may not be “doing anything” I can still pray and worship my Creator. I had my third year anniversary with Petco as a Dog Trainer this past October. I am the only Dog Trainer at our Petco facility and I can honestly say I get to go to work and play with dogs and meet all kinds of new people! I am also still plugging away at my other business of building websites and doing the occasional business consulting or some other odd job. I still continue to housesit (rather check in on and take care of) Jan’s 4 Cockatiel birds and take care of plants, yard, pool, and anything else while her and her husband travel off and on throughout the year. Sometime in late January or February (I can’t remember) I fell out of a tree while trimming some errant dead branches. So I began another round of Physical Therapy and although I have two bulging discs one of which was torn, after going through Physical Therapy, my back is in better shape than it has been in years. In March, the California Department of Vocational Rehabilitation authorized retraining and education for me to attend the Animal Behavior College to become a Professional Dog Trainer (technically that is what I am at Petco) but this will in the future open doors of opportunity for having either potential growth via Petco or branch out on my own a bit more. I finished the online and book learning in August and began my externship with a Dog Training Mentor in September. I finished phase one of three before the rains and the weather permitted anymore. I hope to finish the last two phases early spring. I also hope to begin my volunteer requirements with the Shasta County Animal Control after the first of the year. When my externship and volunteer phases are completed, I will then take my final exam. I hope to continue with my dog training education in working with Shelter dogs and rehabilitating problem behavior dogs and dogs who have aggression issues. During the Spring/Summer of this past year I taught Agility classes for the Nor Cal Dog Training Club and had a great time. Also with the Nor Cal Dog Club and through my own dog training business, me and a few friends of mine did some demonstrations at some local elementary schools in April and June. We did Obedience, Agility, Flyball and Tracking demos. It was lots of fun for the dogs, the kids and us! I have also been busy doing demos or having informational booths at various “animal/dog” events in and around my community. In April, I had an info booth and offered the AKC Canine Good Citizenship (CGC) testing for the annual “Love Your Pet Expo” a benefit for local animal rescue groups. My Shetland Sheepdog, Dani Joy, did some Agility and Flyball demos at this event and had a great time. In May, I participated in the Haven Humane Society’s Dog-a-thon. In August, I did some demos with 2 other dog trainers in the area at the Open House for the Wild Horse Sanctuary in Manton (near Shingletown east of Redding). Unfortunately, Dani Joy ended up with a foxtail embedded in her chest wall and had to have surgery as it was headed to the heart/lung cavity. Thankfully, she is doing great now. Also in August, I had an informational booth with Petco at a fundraising event called “Woofstock” a benefit for a local animal rescue group. In September, I coordinated a demo event for the Nor Cal Dog Training Club at the annual Honey Bee Festival in Palo Cedro where we did Agility, Rally Obedience, and Flyball demonstrations. My two Shetland Sheepdogs (Shelties) Patrick Ryan and Dani Joy showed off their stuff in Flyball and Dani Joy got her picture in the Palo Cedro newspaper. My Italian Greyhound Skippy did some beginning Agility at the demo as well. Also in September, I went to the 2nd Annual Chico Canine Carnival, a benefit for Animal rescues in Butte County. I offered the AKC CGC testing and my dogs did Flyball demos. I was supposed to do some Flyball demos and some more AKC CGC testing for the Siskiyou Paws for Walk fundraising event that same month, but ended up coming down sick. In October, I coordinated a dog-sport community event in Anderson called “Pawsibilities Unleashed” where we had numerous dog trainers, dog sporting activities and animal rescue groups putting on demonstrations, offering information and encouraging responsible dog ownership. After that event ended, I resigned from the Nor Cal Dog Club. I am now also an inactive member with my flyball team the Gold Coast Flyers. I am very focused on working at Petco, getting my education and certifications needed for being a dog trainer. Still on the subject of dogs… over Memorial Day Weekend I traveled down to my dad’s home in El Dorado, CA and went to the “Hangtown Kennel Club’s Dog Show” where I had Patrick Ryan entered for 3 days in competition Rally Obedience (Rally “O” for short). He came home with 2 qualifying scores. He needed 3 to get a Rally Novice title, unfortunately, his owner (me) messed up – always “handler error” – and it was his best performance of the weekend and my dad and step-mom, Marti were there to cheer me on and take pictures. In the second week of June, I went to a four day dog show in Gridley, CA and entered both Dani Joy and Patrick Ryan in Rally “O”. Dani Joy got her title in Rally Novice on the fourth day. Patrick Ryan got his Rally Novice on the first day, and 2 qualifying scores on the 2nd and 3rd day, in Rally Advance, however, like the last show, Patrick did a “star” performance but once again – handler error! So we need another show to get his title in Rally Advanced. I was still so very proud of them! Skippy got his AKC Canine Good Citizenship while we were at the Chico Canine Carnival in September, which is his first step in any kind of event. I hope next year to enter him into Rally “O” and by the way, he is finally house-trained! Skippy will be 4 years old in March. He still has some behavioral issues to work through like “resource guarding” he thinks EVERYTHING belongs to him, the living room, Dee, the cats, the toys, the yard, etc. Patrick just turned 10 years old this past week. He is showing more of his age and he is losing a bit of his hearing. But he is still as smart as a whip. He is now learning new tricks and I am thinking of taking up the sport of Canine Freestyle (a.k.a. doggie dancing). Dani Joy will turn 7 years old in January and is still the live wire as ever. Although she has mellowed just a touch enough to focus more on commands and do her Rally “O” and a few tricks too! Dee still has her 2 beautiful Havana Brown Cats, Alexandria Rose, better known as “Buppie,” and Misty Rose. They will both be 5 years after the first of the New Year. They still play and chase each other around the house like a couple of kittens. Shawn who was a rescue kitten grew into one big BOY and was terrorizing the other two so he was placed into another home. Our newest addition arrived at our home Wednesday afternoon, December 9th, via an animal rescue group from the Burney/Fall River Mills area. They brought to our home a 10 month old male pup named “Bingo” who is ¾ Australian Kelpie and ¼ Queensland Heeler. He is a FOSTER dog that I am helping to rehabilitate so he goes with me to Petco and helps me teach my dog classes. He came from an elderly man who had beaten the dog and threw him outside in 6 below zero weather. He had no fenced in yard in the mountains and the dog was often found running along the side of the roads and freeway. He was terribly mistreated and the rescue group had been trying to get the man to surrender the dog to them for quite some time. The rescue group paid to have him neutered in November and he got at least a Rabies shot, but hadn’t had any other vaccinations. He was starving for love and attention and terribly neglected. He is very smart and learns commands very quickly. It is a delight to work with such a sweet dog. It is also sad to see him belly crawl and cringe and the slightest movement that reminds him of his mistreatment. He had never been on a leash, been in a crate and stayed outside most of the time. He is now wearing a harness and is walking on a leash beautifully, is crate trained, knows several basic commands and gets along with all the other animals except Skippy and Buppie, who don’t like him, but Bingo is smart enough to stay out of their way. I will keep working with him at least through January and see him through his second set of vaccinations and get him ready for adoption, with nice manners when he is ready to be placed again. We have since renamed him, “Christmas Beau Ty,” and call him “Beau Ty.” It seems to fit him perfectly. There are many offers for a home for him coming in when I am at work. If you are looking for some unique gifts for friends or family or for yourself… check out my website at www.kieranna.com and look under web design and/or web portfolio and take a look at some of the sites I’ve built. I am always looking for new websites to build. My roommate, Dee, continues to be completely disabled due to her back injury and constant Fibromyalgia pain. However, she has over 20 penpals that she corresponds with on a regular basis including a couple of ladies in prison. Her youngest son Joey got married this past year and lives in Colorado. Her oldest son, David and his wife Crystal, were recently medically discharged from the Army and have moved to Red Bluff, just 15 minutes south of us. So Dee is pleased to have at least one son close to home and his 4 boys live in Redding with their mom. Her middle son, Tim, is still not in any contact with her and she rarely gets pictures or notes from his ex-wife about the other 2 grandchildren. It breaks her heart, so please pray for that situation. I know longer attend St. Andrew’s Serbian Orthodox Church, but I occasionally attend St. Nicholas Orthodox Church of America. I am trying to become more of a regular attendee, however, I often work nights and find it very hard to get up in the morning… (I never was a morning person anyway and now it is more difficult). In June & July my sister traveled to Ireland and then to Israel for research work for Westmont College where she is a Professor of Communications Studies. My Dad is still the Pastor of El Dorado Community Church and Marti, my step-mom still runs their bookstore, in El Dorado “Books-n-Bears”. In August, my family (Dad, Marti, Deb & Keith) and I (and 3 Shelties, mine and my sister’s) went on our annual family vacation but this time it was in some connected cabins along the Russian River. We had lots of fun canoeing, fishing, playing games and walking along the beach and visiting the little tourist shops around the area. My youngest brother Matthew Jason Dunn is a singer/songwriter/dancer and is loving his life! He recently moved to a beautiful new home in Aptos, CA. During the last part of October I came down with a stomach/intestinal virus and so did Dee. It was awful, but nothing like when I came down with the Swine Flu over Thanksgiving weekend. As it went through its course, I then came down with a secondary respiratory infection a mild case of pneumonia. So I was off work for 8 scheduled days… so my dog training schedule went haywire… but I am back at work and things are getting back on schedule. I have entered another technological phase of our world of text messaging and social networking. So I am on FaceBook, MySpace, ZooToo, LinkedIn, Classmates.com, and a few others that I don’t remember. So if that is your thing look me up. My life is interesting, changing and I am changing and growing. I am still gradually gaining some of my health and hope to continue getting well. I am also constantly reminded the reality of life is about getting old and our journey towards eternity; this is earth and not heaven. What really matters is how we lived in light of eternity and our relationship with others and with God. I pray that this year will be one of renewed hope and commitment in your own journey towards eternity and walking with God. Thank you for being in my life, for being who you are, for being a blessing, for praying for me, and the privilege of me praying for you. Much love, hugs and prayers for you and your family.